Ever since I had my first taste of green tea icecream from my favourite Japanese restaurant I have been hooked on the fragrant and delicate flavour of green tea. And now whenever I walk into an Asian bakery, filled as they are with exotic and exciting flavours, I always find myself gravitating towards the delicious green tea and red bean buns and purchasing one (or several). So I thought, what better way to combine my love of the flavour of green tea with my love of baked goods but to create Green Tea Cupcakes? I have baked a lot of cupcakes in my time and I have to say this is definately the easiest recipe I have used by far. So if you're not a confident baker but feel enticed to try out the green tea flavour, don't be afraid to give these a whirl. 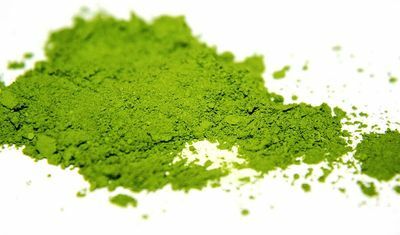 You can purchase green tea powder, also known as Matcha powder, from Asian grocers (but make sure to get the powder and not tea leaves). It can be a little pricey but you use very little so it goes a long way. I finished these tasty morsels off with a green tea icing and a coconut icing which suited them to a T (no pun intended). Pre-heat your oven to 180 C (fan-forced). Mix the sifted flour, sugar and green tea powder together in a large bowl. In a separate bowl mix the milk, melted butter, beaten eggs and vanilla essence together. Add the milk mix to the flour mix and stir with a wooden spoon until combined. Spoon mix into pre-lined cupcake pans and bake for 15 minutes or so (or until the cupcakes spring back when you touch them) and leave to cool in the pan for 5 minutes before transferring them to a cooling rack. This mix will make approximately 12 cupcakes. Soften the butter a little in the microwave (but be careful not to melt it), and then beat for several minutes until it is lighter in colour and looks somewhat whipped. Gradually add the icing sugar, beating well after each addition. Finally, add the milk a little bit at a time until it becomes spreadable, but not runny. This will be more than enough to ice 12 cupcakes with plenty to spare. To make the green tea flavoured icing, add 2 tsp of green tea powder to half of this icing mixture and stir well to combine (again adjust the amount of green tea powder used according to your tastes). To make the coconut flavoured icing add 2 tsp coconut essence (or more if you want a stronger flavour) to half the mix and once iced top cupcakes with toasted shredded coconut - Thanks to my baking partner in crime for this flavour combination idea. These cupcakes are a cinch to make and are sure to delight all those who try them. For an interesting variation try adding a teaspoon of red bean paste inside the cupcake - simply put a bottom layer of batter in the cupcake pan, put a dollop of the red bean paste in the middle, and cover with more of the green tea batter. These sound delish! I'm also a huge fan of matcha green tea flavoured things, and become one after trying green tea ice cream. I love green tea mochi, and I've also found a green tea ice cream mix at Asian grocers for easily making my own ice cream. I've made green tea macarons before, and LOVE green tea smoothies. But I have never had a green tea cupcake. I'm definitely bookmarking this recipe to give it a go sometime, as I'm a huge cupcake baker. Thanks for the tips. Hopefully my cupcakes look as good as these do! Thanks Natasha :) Green tea macarons sound tasty - what did you fill them with? I got my powder for about $14 for around 300g I think it was, and that was the cheapest I could find. But it was much better value than the smaller packets, and I've seen the big bag in a few Asian grocers so it should be pretty easy to find.